After a smooth flight from St. Barths to Anguilla, we were whisked away by our sweet Wendell—who has been our longtime driver on Anguilla. The only challenge of getting to Anguilla is the complicated entry (think many stamps and too may forms); something to be aware of. Our "palace" for the next three nights. It’s a little off the beaten path on the north shore, but what a villa! Kishti, meaning “boat” or “ark” in Urdu (the owners are of Indian descent), sits right on the water’s rocky shore. The villa, supremely modern, has floor to ceiling windows, outdoor showers, and chic décor with a view from every room—the type of beautiful home you might find (or dream about) in Malibu. The restaurant scene in Anguilla is robust with options ranging from BBQ on the beach to haute cuisine. We spent the first dinner at DaVida restaurant, which is about a ten-minute drive from the villa. Steve continued his mahi-mahi tour of the Caribbean, and deemed theirs par for the course. After a great night's sleep (Lidy's perhaps the most enjoyable, as she drew straws for the master bedroom. In a word? "Magic") we started our villa tour sprint. With vibrant flowers decorating the entrance, Villa RIC COY - Villa Coyaba has colorful accents and elegant wood paneling throughout. The standout here is the pool, surrounded by palms and a clear view of St. Martin. Each of the six bedrooms are quite equal in their furnishings and size (a plus with couples traveling together). The villa also has a path leading down to a secluded cove for sunbathing and quick (or not so quick) dips. We had dinner in true blissful villa-life fashion, treated to us by the lovely villa owners (who divide their time between Toronto and Anguilla) and catered by the former regular chef of Villa Bird of Paradise. We started with cocktails on the deck and had lovely, lively, and all at once inspiring conversations over dinner. We fell in love with the recently redone 6 bedroom villa. The villa boasts crisp and playful furnishings—the pool chaise lounges have cozy slipcovers, and the interiors feature tufted, colorful sectionals, expansive windows, and accents like glossy surfboards standing in for traditional artwork. The entire house is modern, while retaining a personality and a totally comfortable set-up. Just 10 minutes from the angelic white grains and calm waves of Sandy Hill Beach, the villa lends itself well to families traveling with small children. Another favorite was the aptly named Villa Sandcastle in Little Bay. Ornate furniture and architecture give the villa its regal feel, but soft touches throughout (oversized couches perfect for afternoon naps, daybeds in a kids’ carpeted media room) really make the villa feel so liveable. 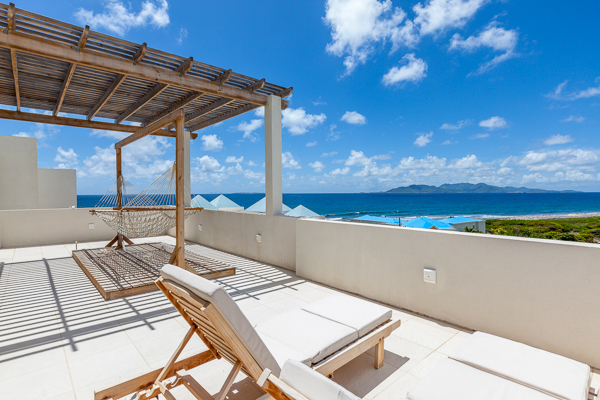 With a well-equipped barbecue and bar gazebo out by the pool, as well as a private gym (just off the master bedroom), this villa seems to have it all (along with mesmerizing views of the Atlantic). One of the best meals of the trip came off a recommendation from fellow villa specialist Bethany (when it comes to restaurants, we’re usually never short on some good suggestions) who led us to Jacala, on Meads Bay Beach. Jacala is a combo of the originals owners Jacques and Alain’s names, who cooked and served for years at the Malliouhana hotel before starting their own spot. Set just back from the beach, the restaurant has outstanding, refreshing fare (think chilled cucumber soup and marinated seared tuna). Anguilla is truly a pristine experience, both from its beaches with clear waters and white sand, to the many impeccable dining experiences on the island. With villas that are well appointed in terms of amenities (and often times, staff), and calm seas and breezes, it’s an ideal island for couples seeking uninterrupted relaxation, or families traveling with young ones. We can’t wait to go back (and send you there! ).